It's always been a question of "do I use all of this chicken meat?" or "how long can I keep this leftover chicken fresh?". Well, not today! Thanks to poultry distributors finally getting the message that we like to eat chicken but we also like to save money by not wasting chicken we didn't finish or never had that chance to cook it due to freezer burn. I began noticing this trend in the poultry section with Foster Farms' products, then Perdue Chicken and today I just saw a commercial for Ziploc's Perfect Portions Bags. I'm really glad Ziploc got on this train. I really like Perfect Portions Bags because I can store any unused cuts of meat and best of all I don't have to touch raw meat with my bare hands. I'm absolutely vigilant with avoiding cross contamination in the kitchen. Anytime I or my utensils touch raw food, I'm always washing my hands or using new utensils to keep cooking. Sounds neurotic but if you've ever worked for a home daycare center that worked in conjunction with the government you would be just as strict as me. Okay, enough of my crazies. I can't find the Ziploc Perfect Portions commercial I saw today but here is the link to watching Rachael Ray show you why this product is her new fave. I knew watching Anthony Bourdain's No Reservations show would one day bring me to a place of accomplishment in the kitchen. I want to thank No Reservations for creating the Techniques Special show. Now I know how to roast a chicken like a champ, make the perfect french fries (btw, I'll be making purple french fries) that will most likely end up sticking to my thighs and how to cook a burger that would make a grown man cry. I hope you enjoy these videos and I hope that they help enhance your cooking techniques for a better and satisfying tomorrow. Happy Friday and St. Patty's weekend! The Fries (Starts at 1:56). But following that clip is how to make steaks like a pro. Click here for more techniques from Travel Channel's No Reservations. It was on sale and I couldn't resist. 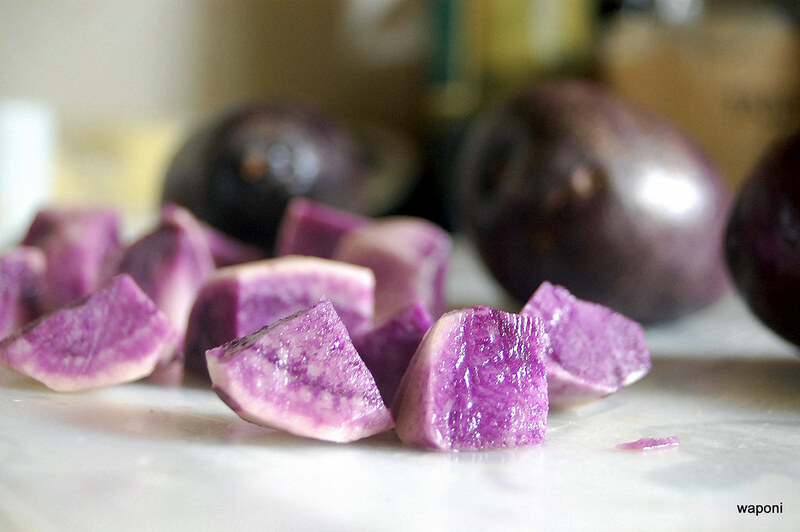 I've seen and tried purple cauliflower before but a purple potato was something else. How cool is that? Now I can freak out my family by making mashed purple potatoes for Sunday dinner. I could make purple french fries, purple potato bread...etc. How fun! But first, let me start off by making something simple: Breakfast Burrito with Purple Potatoes. 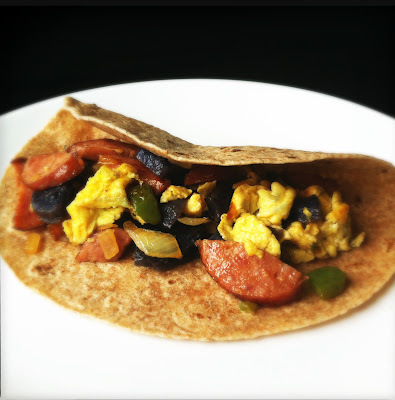 Place scrambled eggs and sautéed ingredients on warm tortilla. Spoon salsa over mixture and garnish with cilantro. I've had the most lovely time with my dear friend Lacy this past week. We had so many adventures and I look forward to more this year when she can came back with her husband. One of the evenings, she wanted me to show her how I make this simple ground chicken dish called Nam Prik Ong. I'm sure if I did it the true Northern Thai way, the flavors would be a little more layered and exquisite. However, with time being of the essence these days and for those of you wanting to know how to spice up plain old ground chicken, this recipe might be the dish for you. Before you try making Nam Prik Ong I have to forewarn you about one ingredient that is essential yet hard to cook with due to smell. I love it, my mom and sisters love it, but my dad runs away from it. It's called, Kapi (in Thai), fermented dried shrimp paste, and it is used in many southeast asian dishes. It smells awful but I promise you, it's worth the taste! You can purchase this ingredient in your local asian market. Heat pan on medium-high. Add oil and let heat for about 30 seconds. Add garlic and red crushed peppers and fry garlic until lightly golden. Then add fish sauce and kapi. Add a little water if the mixture is dry. Fry mixture for about 30 seconds. Add ground chicken and cook until the pink is gone. Add stewed tomatoes, crushing tomatoes and stirring in chicken until chicken is crumbled and well mixed. Finally add bouillon and mix well again. Place Nam Prik Ong into bowl and garnish with cilantro. *You can also add cilantro into the mixture for more flavor. And as always adjust food according to your preference. Personally I would add more heat and kapi!